The ASI Lucia Choir is a seasonal youth choir who come together to rehearse and celebrate Sankta Lucia day for ASI members and the greater Twin Cities community. Knowledge of the Swedish language is not necessary. Basic language and music instruction is incorporated and supported through rehearsals. Registration for participants from 2014 Lucia Choir begins Monday, Sept. 28. Deadline: Friday, Oct. 9 at 5 p.m.
New family registration begins Monday, Oct. 12. Open until choir maximum is achieved. Call 612-871-4907 to register your student(s). Nov. 8 Grades K – 4 1-1:45 p.m.
Grades 5 – 8 2-2:45 p.m.
Grades 9 – 12 3- 4 p.m.
Nov. 15 Grades K – 4 1-1:45 p.m.
Nov. 22 Grades K – 4 1-1:45 p.m.
Nov. 29 All Choir Rehearsal 1 p.m.
Dec. 7 Dress Rehearsal Larson Hall, ASI Group Photo 6 p.m. Gown check out will take place at the first rehearsal on Sunday, Nov. 1. We have many gowns in a variety of sizes but cannot guarantee availability. Donations of outgrown Lucia gowns are happily accepted. The ASI Lucia Choir cannot function without parent volunteers. We require EACH family to sign-up for at least 2 volunteer shifts including one clean-up shift either at the dress rehearsal or a concert. Sign-up will take place Sunday, Nov. 1. Please note: Demand is always very high for tickets to the December 13 Lucia in the Mansion performance. Tickets may be purchased by calling (612) 871-4907 or in person at the ASI Information Desk starting Sunday, Nov. 1. Tickets are limited for each performance and do sell out quickly. Every year, the American Swedish Institute chooses two young women and one young man to be Lucia, Attendant and Head Starboy. 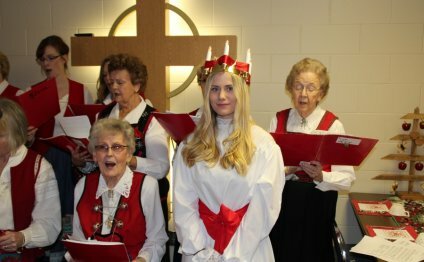 Demonstrates interest in Sweden, Swedish-American culture and an understanding of the "spirit" of Lucia. Demonstrates a strong involvement in the American Swedish Institute. Lucia, Attendant and Head Starboy are encouraged to be members of the ASI Lucia Choir and must be available for the ASI Lucia Choir performances. Preference is given to applicants with ASI membership and who can show current or past participation in ASI or other Swedish or Swedish-American programs. Submit a typed one page essay about your education and academic honors; community service, activities and accomplishments; interest in Sweden and Swedish heritage; and your involvement in ASI.